LSE Treatment Clinic is a multidisciplinary clinic providing a variety of treatments for a wide range of conditions. Sitting at a computer for long periods of time can take a toll on your body. By not sitting with the correct posture, it is easy to end up with back pain, neck pain, knee pains, and a tingling in the hands and fingers. 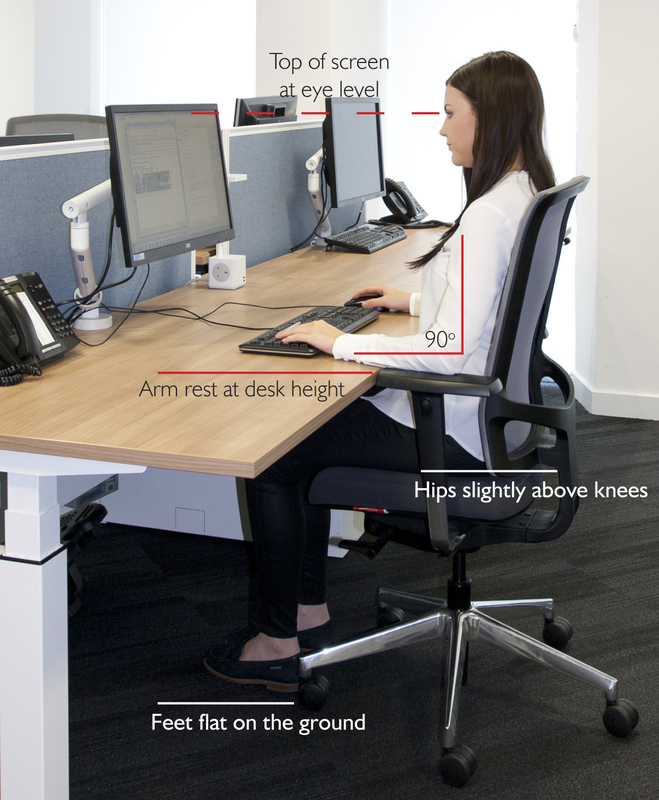 Here are some tips to maintain good ergonomics and stay comfortable at your desk during the day. You can reduce your risk of back pain by adjusting your chair so lower back is supported correctly. A correctly adjusted chair will reduce the strain on your back. If possible get one that is easily adjustable allowing you to change the height, back position and tilt. Your knees should be slightly lower than your hips. Use a footrest if necessary. Your elbows should be by the side of your body so that the arm forms an L-shape at the elbow joint. Rest your feet on the floor. Place your feet flat on the floor. If they’re not, ask if you can have a footrest which lets you rest your feet at a level that’s comfortable. Don’t cross your legs as this may contribute to posture-related problems. Place your screen at eye level. Your screen should be directly in front of you. A good guide is to place the monitor about an arm’s length away, with the top of the screen roughly at eye level. To achieve this, you may need a monitor stand. If the screen is too high or too low, you’ll have to bend your neck which can be uncomfortable. Tuck your chair in as far as possible, so that you are almost touching your desk with the lower half of your body. Place your keyboard in front of you when typing. Leave a gap of 4-6 inches (100mm-150mm) at the front of the desk to rest your wrists between typing. A wrist rest can be helpful to keep the wrists straight and at the same level as the keys. Position and use the mouse in line with your shoulder. A mouse mat with a wrist pad may help to keep your wrist straight and avoid awkward bending. If you’re not using your keyboard and it is in the way, push it to one side to make space for the mouse.